Note from January 2019: This post is still as relevant today as it was when I first wrote it, and I still get messages from people saying how useful the info is. Hope you find it useful too! A couple weeks ago, I talked about how A/V receivers are avoidable if you really don’t want one. This post is for the rest of us — the people who love our surround sound and like having a quality A/V receiver, but we also have a smart TV with cool apps of its own. If you’re like me, all your components (Blu-Ray player, game system, cable box, etc) plug into the A/V receiver, which sends the video to your HDTV while sending the audio to your external speakers. That means the apps built-in to the HDTV aren’t connected to your good surround sound speakers. The apps have to use the crappy speakers built into your TV. What’s a sound-loving techie to do? Have no fear. There is hope. A digital audio out port. Note #1: These methods are good for getting any sound off your HDTV and back to your receiver. For example, your HDTV may have an over-the-air antenna built-in that you like to use. 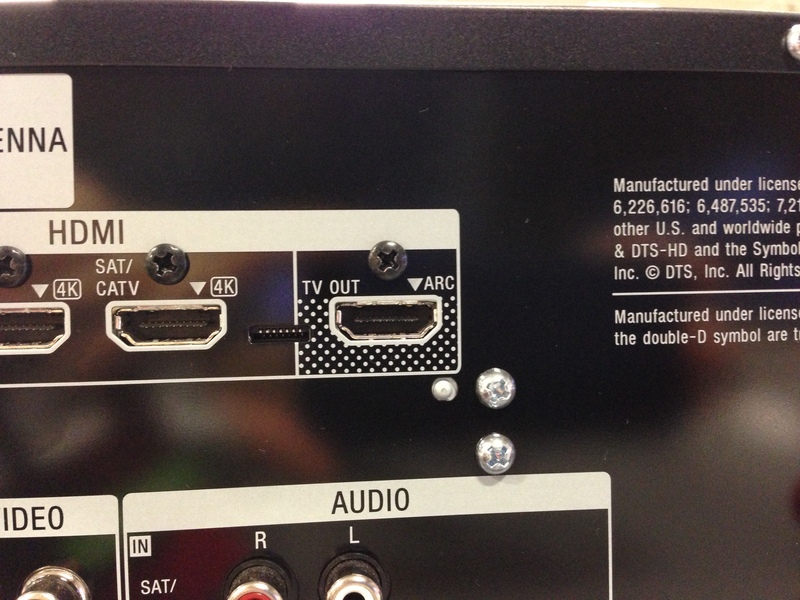 The good news is that if your TV has built-in apps then it also probably has a “digital audio out” port (see photo). 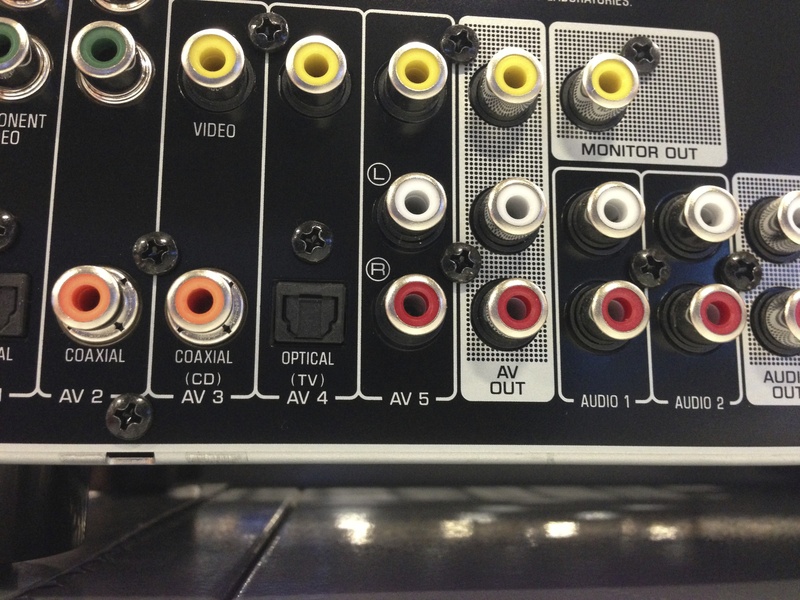 Most brands have been including digital audio ports on their HDTVs for years, so even older sets should have one. Bonus points if your digital audio port can send out a full Dolby Digital 5.1 signal (refer to your TV’s manual for any possible limitations on its digital audio port). Note #2: When using your TV’s digital audio out port, you’ll also want to set your TV so that it will send out a “fixed” audio signal even when the TV’s internal speakers are muted and/or turned off (as they should be). See your TV’s manual for this. There’s usually a menu setting for this. An analog audio out port. Note #3: If your TV does not have any kind of digital audio port — and you’ve really, really looked for it — it might still have analog audio outputs (see photo). These can work too, but the sound won’t be as good. And if you’re really desperate, you can use your TV’s headphone jack to get audio back to your receiver, but you can forget about any kind surround sound at this point. Simply plug your TV’s audio-out into an empty input on your receiver (preferably one set aside just for audio, like the CD input.) When you use your TV’s built-in apps, just set the receiver to that input. The upside: You can do this with just about any receiver, even a really old one. The downside: It’s a pretty crappy solution. You won’t be able to use the TV apps concurrent with video from your cable box or blu-ray player. You will only be able to see video provided by the apps themselves. For Netflix and the like, that’s not such a problem, but for others, it might be. All the methods below are preferable to this one, if possible. Method #2: Use your receiver’s “TV” input port. If you have a new-ish receiver, it may have a port set aside specially to receive audio from your TV. 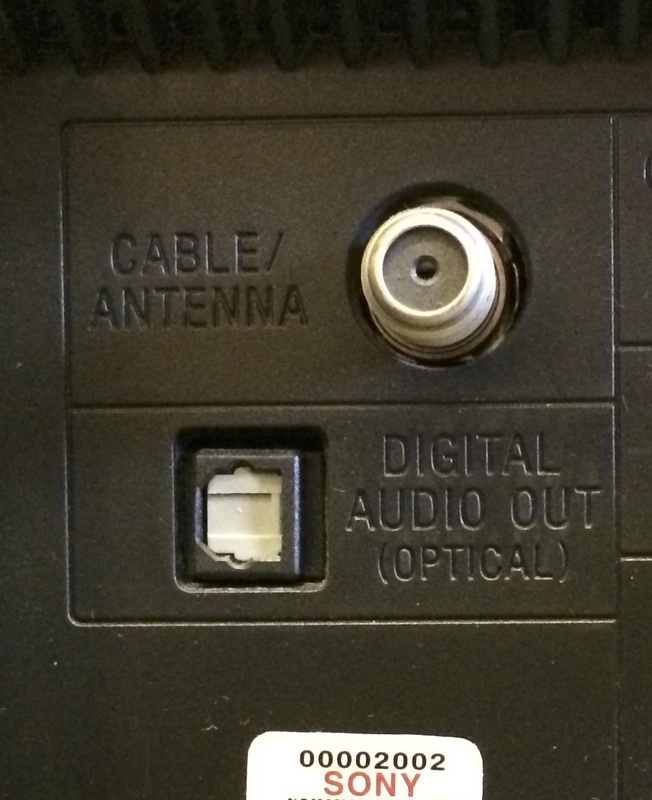 Note the digital audio jack labeled “Optical (TV)” in the center of the picture. This port should play nicely with your Smart TV. I say “should” only because every manufacturer has their own idea of how things ought to work. Method #3 Use an assignable digital audio port on the receiver. This receiver has two assignable ports. Most receivers only have one, but one is all you need. If so, you’re in luck. This is my preferred way to get sound from a Smart TV. Again, you’ll need your manual to see exactly how it’s meant to be used (and how to set it up), but the basic gist is this: Connect your TV’s audio-out port to an “assignable” port on the receiver. You then set your receiver so that whenever you switch to a particular HMDI input, instead of using audio supplied by the HDMI cable, it’ll use the audio from this port instead (which comes from the TV). Note: If you connect your TV to the receiver via component cables (and not HDMI), this method might not work. 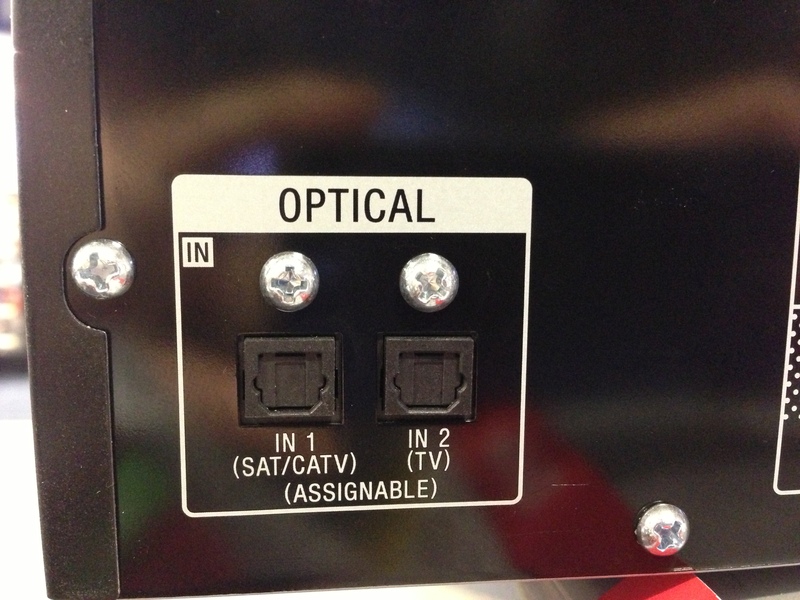 Real life example: On the receiver in my family room, I noticed that there’s an assignable digital audio port that goes with the SAT/CATV HDMI input. I plugged the digital audio output from the TV into that port. The sound from my DirecTV box now travels via HDMI through the receiver to the TV… and then that sound keeps traveling back into the receiver. When I’m watching TV, the audio doesn’t sound any different. But because the sound is technically coming from the TV and not directly from the DirecTV box, whenever I load up the Netflix app built-in into the TV, that sound plays through the speakers, too. Make sense? Technically, the most current HDMI standard comes with the ability retrieve sound from your TV automatically. It’s called ARC. If you have both a relatively new TV and a relatively new receiver, this could be your best (and easiest) option. Note the letters “ARC” on the HDMI-out port. The set-up is dead simple: If you have both a TV and a receiver that supports ARC, a single HDMI cable between them can send information bidirectionally. In other words: It can send video from the receiver to the TV, but it can also send audio from the TV to the receiver. No special set-up required. Just one cable. Receivers with this ability will have the word “ARC” next to its TV output. HDTVs with this ability will have the word “ARC” next to one of its inputs. Not only is ARC intended to send audio signals from your TV back to your receiver, but it’s also — theoretically — able to send remote commands, too, though I haven’t been able to test this ability myself. At the least, you’ll probably need a TV and receiver made by the same company, and the company will have to make sure to include the necessary firmware that’ll make this happen. If I were you, I’d be happy just getting the audio to work right. Note: ARC functionality isn’t limited to TVs and receivers. Some soundbars feature the specification, too. Also worth noting: Older HDMI cables might not work with ARC. If both your TV and Receiver support ARC and but things aren’t working, you might want to try a new HDMI cable. If your TV’s digital audio port only sends out a stereo signal (as many do), ARC could be a way to get full 5.1 channel surround sound back to your receiver. For further reading about ARC, you can check out this piece at HDGuru. So there you go. Four ways to get sound from your Smart TV back to your receiver. Bon chance. UPDATED JANUARY 2019 — ARC has become a much more reliable — and established — feature. But your usage may vary. My advice: Try it first, but prepared to try one of the other options. Look, if you have a dedicated home theater space with 5 or more separate speakers, then, yeah, you’ll need something to control them. But you already know who you are and you aren’t reading this. If that is you and you are reading this, then stop. You do need an A/V receiver or something like it. This post is for people who landed here after typing “Do I really need an A/V receiver?” into a search bar. To you, the answer is: Only if you want one. It’s not a requirement for good sound these days. Why wouldn’t you want an A/V Receiver? Three reasons: Added complexity, cost, and feature redundancy. The added complexity is evident every time you try to tell someone else how to watch TV: Turn on the TV, then turn on the receiver, then set the TV to video input 1 and the receiver to SAT/CAB, oh, and then make sure the cable box is turned on, and remember, if you want to control the volume don’t use the TV remote! Why does simply watching TV have to be that complicated? Sure, you can get a universal remote that might streamline the process, but they aren’t perfect. Even a top-of-the-line smart remote can be problematic it gets out of sync with your equipment (for example, if the remote thinks a component is on when it’s really off). The only true way to simplify the experience — and increase the reliability of universal remotes — is to reduce the number of overall components. The cost is evident in the amount of money you’ll be missing from your pocket. The redundancy is evident in the other features you probably don’t need. For example, a lot of receivers now come with Apps built-in (Pandora, Netflix, etc.). Sounds great, except chances are you have those same apps also in a different component. Do you really need Netflix on your TV, Blu-Ray player, Apple TV, smart phone and your receiver? So why would you want one? 1. As mentioned, you want true surround sound. 2. You like listening to the radio. 3. You have more video components than your TV has inputs. As TVs gets thinner and slicker, the built-in speakers gets worse and worse (or, at least, it seems like they do). You really don’t want to rely on your TV’s built-in speakers for anything cinematic, which means you will want some sort of sound system, just not one that requires an A/V receiver for power. I’m a big fan of soundbars for this very reason. NOTE: If you are perfectly content with the sound from your TVs speakers, and you just need a device that can switch between your many components — cable box, blu-ray player, game system, etc. — you can just get an HDMI switcher. HDMI Switchers are much cheaper than full-fledged A/V receivers. If the idea of a soundbar intrigues you, consider doing what too few people do these days — plug all your components directly into your TV’s multitude of inputs. Then use your TV’s “digital audio out” port to send the audio from your TV to the soundbar. And that’s it. Every time you change inputs on your TV, the soundbar will automatically keep up. Even better: You can get a soundbar that will automatically power up when your TV turns on, meaning you never have to worry about turning it on or off. You can then simply program your cable or satellite box’s remote to adjust the Soundbar’s volume instead of your TV’s, eliminating the need for a universal remote (for TV watching, at least). Pro Tip: If your TV allows you to turn off the internal speakers completely, do it. That way you never have to worry about accidentally hearing sound from both the TV’s speakers and the soundbar. Many newer HDTVs have that option. If yours does, then it also probably has the option to send a “fixed” audio signal to the soundbar, meaning no matter what the TV volume is set at, the soundbar will still get the signal it needs. Ideally, you want a set-up where the TV’s speakers are off completely and the only way to control the volume is from the soundbar. Another option: Find a Blu-Ray player with HDMI inputs. They’re rare, but they do exist. Being able to use your Blu-Ray player as an HDMI switcher can streamline the number of components in your home theater, which is always a good one thing. 1) If your HDTV doesn’t have “discreet” inputs. “Discreet inputs” means that each input on the TV has it’s own separate remote code to switch to it. That’s very handy for universal remotes. For example, let’s say your cable box is input 1 and your Blu-Ray is input 4. With discreet inputs, your universal remote only has to send one command to switch from “CABLE” to “BLU-RAY” and vice versa. The chances of messing up are rare. But if your TV doesn’t have discreet inputs, then that means you can’t switch from input 1 to input 4 without cycling through inputs 2 and 3. And to get from 4 to 1, you have to cycle through 5, 6, etc, all the way back to 1. In other words — the universal remote has to virtually send many button presses to accomplish one task, which is very prone to errors. If you like the idea of pressing a single button and letting the remote do all the work, you really need a TV (or other device) with discreet inputs. 2) If your HDTV is already mounted to the wall. If your TV is already mounted to the wall, you might not not have access to the TV’s inputs or you might not want to string new cables in front of the wall. For example, I have a TV in my house that was mounted with just a single HDMI cable built into the wall (for the best aesthetics). The idea was to use that single, hidden HDMI cable to connect the TV to a receiver, and just use the receiver to switch between the other components. But to make things easier for my wife, I ultimately decided not to put a receiver in this room. So then what? So there you go… Thanks to an ever-improving stable of soundbars and other devices, if you don’t want the hassle or complexity of a receiver, you really don’t need one. Just took a look around the web, and there really isn’t a Blu-Ray player with multiple inputs I feel comfortable recommending anymore. If I find one, I’ll update this post again. In the meantime, here are some soundbars I like a lot, that can help you both simply your home media experience while still upgrading your sound. This one is less expensive than the Sony, while actually offering “true” surround sound via dedicated rear speakers. Note: The surround speakers require their own power supply, which could restrict their placement around the room. Even less expensive, but still includes a couple HDMI inputs, and good audio reviews. Won’t fill a large room like a Sonos Playbar, but still very versatile if you already have other Sonos products in your house (or you’re thinking of getting some). Also: No HDMI inputs, so you’ll be using your TV as the HDMI switcher with this one, and not getting Atmos. This one is dirt cheap for Yamaha sound (which general ranks really high among soundbars). The trade off? Only a single HDMI input — so it’s target market is cord-cutters who rely on a single streaming box (Roku, Apple TV, etc), and not for people doing a lot of switching between devices. But it also has a digital optical input, so you can use your TV as an HDMI switcher for multiple devices. Also: At this price level (under $200), you’re not likely to get a subwoofer included. At least, not a decent one. In truth, just about any soundbar will be better than your TVs built-in speakers. Looking for other home theater equipment? Don’t forget to check out Amazon’s TV & Video deals.